The instructions here are for backing up and moving your website from Wealthy Affiliate to another host. There are only a few good hosting companies that I recommend so if you haven’t already chosen your new host please read this article. Your website consists of a lot of files and a database. Every post and page is a file and all the images you’ve uploaded are files. The database holds the information that links all those files together so your website just ‘works’. Your Domain Name Servers (DNS) tell the internet where to find those files. In other words the DNS provides the information of which hosting company is hosting your files and database on their servers. If you were to change the DNS before you moved the files then the internet wouldn’t be able to find your website. In order to move your website to another hosting company you’ll need to backup your entire website (all the files and the database) and save the backups on your computer. Then you’ll need to upload the entire website to the new hosting company. I’ll show you how to do this every single step of the way. And I’ll give you a checklist to print out and mark off your progress. To ensure that you don’t waste all your blood sweat and tears from when you built out your website follow the instructions one step at a time in the order given. If you read through all the steps that follow you may become overwhelmed. Just relax, take a deep breath, and then do the steps one at a time. It will all make sense as you follow along. You’ll be using some free plugins (therefore no money back guarantees) so please exercise due care. I strongly recommend that you use FTP as well as the plugins to ensure that all your website content is included in the backups. You may have some files outside of the WordPress installation so you’ll want to back them up too. And there’s always the chance that the plugin won’t work as expected. Yes, the process is a little techie and also time consuming, so I have two things to say to you at this point. If a 70 year-old grandmother (me) can do this then so can you. If you’re really technologically challenged or you just don’t have time then I provide a professional website migration service. Just leave a message in the comments or send an email to marion[at]marionblackonline.com. There’s a 50% discount for my Wealthy Affiliate friends so be sure to mention your WA username. 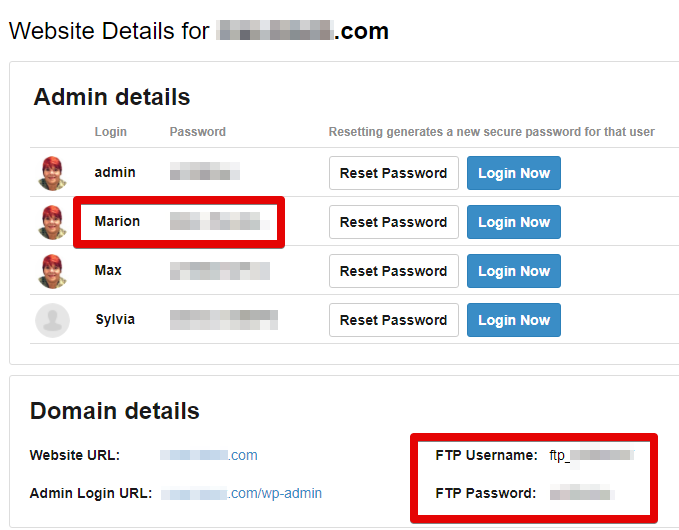 Your WordPress admin login username and password will be different to your FTP username and FTP password. And you’ll need both. To find your usernames and passwords go to Websites > Site Manager and click on Details. Deactivate any security plugins you have installed. You won’t want to get locked out of your website during the migration process. Install and activate WP Clone plugin by WP Academy. This is the plugin you’re going to use to backup now and you’ll use it again later to restore the site at your new host. Please note that the plugin’s developers warn that it fails in about 10% of cases. The bigger the website the more likely the process will fail which is another reason why you’ll also want to use FTP. If the plugin works properly it makes backing up and restoring your website very easy. Otherwise we resort to Plan B, the techie method. Install and activate WP Database Backup plugin by Prashant Walke to backup the database. WP Clone includes a database backup but, as mentioned before, the plugin may fail. Create a text file using Notepad or similar to store all the usernames and passwords that you’ll be needing. Save the file in a folder on your computer’s desktop where you’ll be able to keep all the information and backup files together. Use copy and paste to save your WordPress administrator login username and password in your text file. Save your FTP username and FTP password. Get your usernames, passwords and DNS (Domain Name Servers) details from your new hosting company. Add these to your text file and save. Go to your website’s dashboard and make sure your themes, plugins and WordPress are all up to date. When you install WordPress on your new host it will be the latest version so you’ll want to ensure that the versions match. Sometimes new versions are not backwards compatible. In your website’s dashboard click on WP Clone. Read the welcome message paying particular attention to the paragraph which explains that the restore process will fail on approximately 10% of installations. The bigger the website the more likely that the process will fail. For a small website WP Clone usually works fine. If you’ve been using WP Clone for a while delete all but the latest backup before you go any further. There’s no point in carrying excess weight. 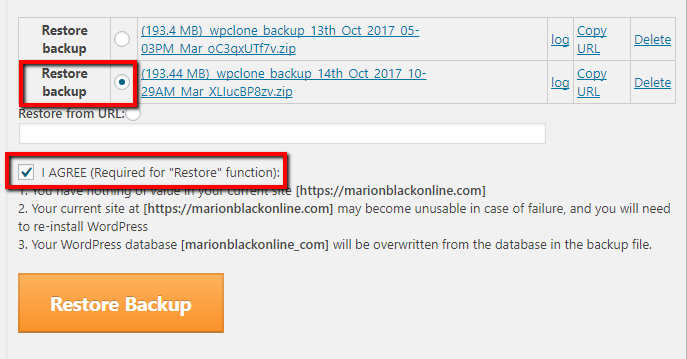 You’ll only want to keep two WP Clone backups on the server, the older backups should be saved on your computer. Click Create Backup, click OK and wait for a few minutes while it does its thing. Click on the link to download the file and save it in your backup folder. Don’t bother with saving the URL as it won’t be accessible once you’ve moved your website. If you get an error message don’t panic. I’ll cover the alternative method in another post. You’ll find WP-DP Backup under Tools in your dashboard. Click on Create New Database Backup. Wait until it’s ready then download the file and save it in your backup folder. 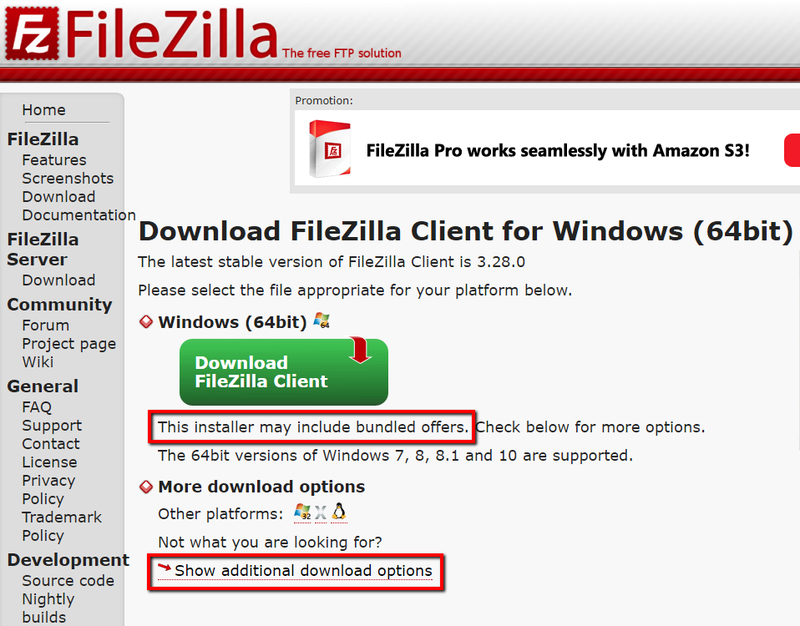 Download and install FileZilla, free from FileZilla Project. Please be careful downloading and installing any free software. For safety’s sake I recommend you click the ‘Show additional download options’ link under the big green Download button. As with all free programs, install with care in case there are other unwanted programs attached. FileZilla can be used on Windows, Mac or Linux, so get the right version for your operating system. Run FileZilla and click on File near the top of the window. Select Site Manager. Add a New Site giving it the name of your website (your domain name). Use copy and paste for the FTP username and FTP password to minimize the chance of errors. Make sure that there’s no spaces before or after the username and password. 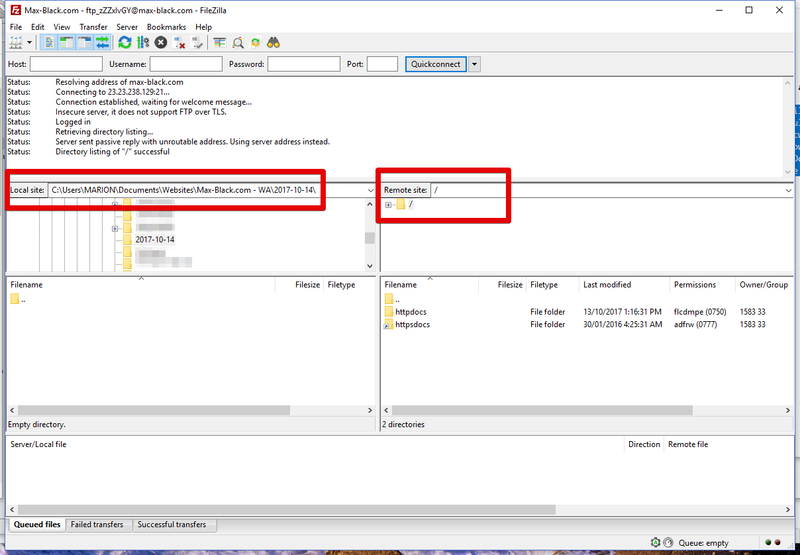 Yes, I know there’s a Quickconnect option but you’ll be using FileZilla again and again so it’s nice to have Site Manager remember all the details for you. 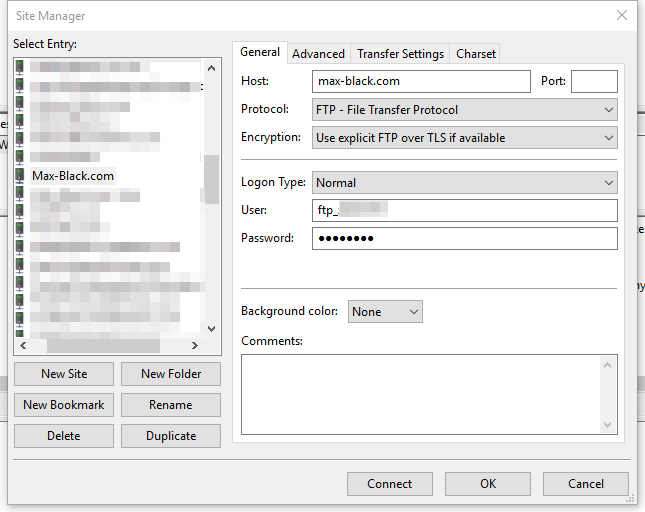 After the move your FTP username and FTP password will be different so you’ll be able to edit the settings in Site Manager. If you have difficulty connecting then try this troubleshooter. On the left side of FileZilla you’ll see your computer (Local site). On the right side is your website (Remote site). On your local site navigate to your backup folder on your desktop. Use right-click and create directory and enter it. Name the directory (folder) with today’s date (yyyy-mm-dd). On the remote site you’ll see httpdocs and httpsdocs. The httpsdocs is a shortcut which leads nowhere. The folder you want to download is httpdocs. Drag and drop the httpdocs folder on the remote site to the local site (from the right-hand side to the left-hand side). Or right-click and select Download. …depending on your internet connection and how big your website is this will take some time. You can just sit and watch the files being transferred. If you can’t see any files being transferred in the bottom window then you may have selected the wrong folder. It’s ‘httpdocs’ not ‘httpsdocs’. While you’re waiting, check your checklist. You did print out the checklist didn’t you? Make sure you’ve completed every single step on the list before you change the name servers to point to your new hosting company. When all the files have been downloaded safely to your computer, and you’ve followed all the other instructions, you can change the name servers. If you bought your domain name at Wealthy Affiliate go to Site Rubix > Site Domains and click on Settings. You’ll find Name Servers at the top of the list. Do not click on Transfer Domain as that is to transfer the domain name registration to a different registrar. Not something you want to do at the same time as migrating your website. Even after you’ve cancelled your premium account you’ll still have access to Site Domains. Type in (or copy and paste) the nameservers you got from your new hosting company. And Save Settings. If you bought your domain name from another registrar then you may need to ask them how to change the nameservers. It can take anything from a few minutes to several hours before your new website is visible throughout the internet. During this period people in different parts of the world will see your website on either the old host or the new host. There is nothing you can do to speed up the process but you can check what’s happening in different parts of the world at whatsmydns.net or dnschecker.org. Once the DNS had propagated you can go to your control panel at your new host and install WordPress. Installing WordPress is very easy at most hosting companies. Look for Quick Install or OneClick Install. If you have any difficulties with this then you can test your new hosting company’s customer support service. They should be happy to help. If you get a new WordPress username and password add them to your text file. You’ll need them to log in the first time. After you’ve restored your website you’ll be able to use your original username and password to login. A standard WordPress install includes some stuff that you won’t need. You may get a sample page, a sample post and a sample comment. There will also be some plugins you may not have seen before. Hello Dolly and Akismet will most likely be there as well as other plugins that your new host thinks you may want. Delete the sample page, post and comment and make sure the plugins are deactivated. Now you can install and activate WP Clone and create a backup of the empty website. This will create a path and folder where you can upload your WP Clone backup of your website that you saved on your computer. It’s so much easier to upload the file when you know exactly where to put it. Your hosting company may provide a file manager for you to access your website’s files but, as you’re now familiar with FileZilla, we’ll use FTP to upload the backup file. Launch FileZilla and open File > Site Manager. Edit your website’s details with the new information you got from your new host. They may require you to use SFTP (SSH file transfer protocol) so use whatever they recommend. SFTP is more secure than FTP. What you see on the Remote site will vary from host to host. The folder you want to be in may be under your domain name or under public_html or something similar. You’ll know you’re in the right place if you can see wp-admin, wp-content and wp-includes. On the Local site side locate the WP Clone backup. It’s a zip file named wpclone_backup with the date you saved it. If you have more than one WP Clone backup make sure you’re using the latest. On the Remote site open wp-content > uploads > wp-clone. You should see the backup you created of the empty website. Drag and drop the much bigger WP Clone backup file from the local site side to the remote site side (left to right). If you need any files outside of the WordPress installation then navigate back to the root directory (where you can see wp-admin, wp-content and wp-includes). Only upload the files that you know you will need such as Google verification or HTML pages that you’ve created or had created for your website. Do not change anything in wp-admin or wp-includes. There’s a lot of stuff that you’ve saved on your computer that you won’t really need if WP Clone works properly. Wait until all files have finished uploading then go back inside your WordPress dashboard. 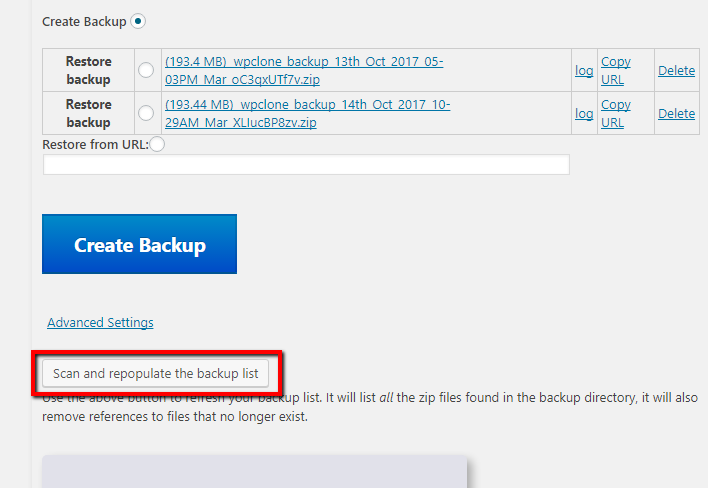 Click on WP Clone and click on the ‘Scan and repopulate the backup list’ button. Now you should have two backup files. Click the ‘Restore backup’ button next to the bigger file. Tick the box that you agree that you have nothing of value in the current site. Then click on the ‘Restore Backup’ button. If everything goes according to plan then you’ll have to login to your dashboard again. This time you’ll use your original username and password that you had at Wealthy Affiliate. WP Clone changes the Permalinks Setting during the restore process so you’ll want to go to Settings > Permalinks and change the setting to ‘Post Name’. Then check to make sure all your internal links are working properly now. Congratulations! You’ve learned how to use FTP and migrate a WordPress website. Give yourself a pat on the back. And please leave a quick comment to tell me how this has worked for you. A most thoroughly detailed set of instructions for moving a website to another host from Wealthy Affiliate. I was a bit worried about having to do this at some time in the future, now I’ve bookmarked this post for later reference and I’ll certainly be back to read it again when I need to. Thanks again for another great how to, Marion. Yeah, I tried that link in the instructions. You have to login to WA. I canceled my premium membership on Sunday before it renewed today. I thought I might be able to sign up as a free member and watch the video but it doesn’t work. It wants me to upgrade to premium. Never mind. I have the clone and database backups so I think that will be enough because my site is small – 148MB. Thanks anyway. Got as far as installing Filezilla. Filled out the form with the FTP username and password and got a critical error. This video should help with FTP connection errors. Hi Marion. There is no WP-DP Backup under Tools in my dashboard. Under Tools I have Import, Export, Forums, SEO Data Import, Export Personal Data, Erase Personal Data. That’s it. I’m the one that asked you recently in a WA forum how to backup my WA site. Thanks for your help. It’s really important to follow all the steps in order, Peter. I haven’t actually started following these steps yet. I followed the video on WA which only mentioned backing up with WP Clone. Then I found this and read the part about backing up the database and thought I was missing something. My plan was to go through all the steps tomorrow since I canceled my membership today. Now, I see I’m not missing anything, so I won’t have trouble doing this tomorrow. Thanks. Hi, what if I just want to sell my domain? 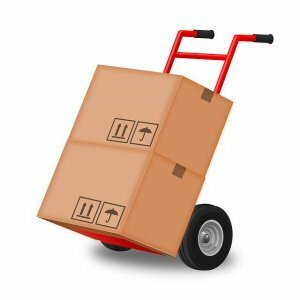 Do I still need to go through the process of moving my website from wealthy affiliate first? Are you trying to sell the website or just the domain name? Hi! I’ve only been with WA for about a month now and I am on the free plan. I’m wanting to buy myself a domain at http://www.namesilo.com since they only charge $8.99 for a year’s service with the (com) extension. How can I transfer my free site over there. It’s a brand new site and I can’t afford $50 a month for premium service. How would that work? Hi Christal, I am not familiar with namesilo.com. Do they provide a hosting service? I can’t see that on their website. I would be very wary of using a domain name service that I’ve never heard of before. I’ve been creating websites for 16 years and I’ve never heard of namesilo.com. Do they provide proper whois protection with the domain name in your name, not theirs? They’re most probably legit, but please do some research before you buy from them. Please see my recommendations for hosting services at https://marionblackonline.com/hosting/ some of the hosting services I recommend give you a free domain name for the first year. Starter members at wealthy affiliate need external hosting if they have their own domain name. Thank you very much for your work. I am preparing to migrate from WA, but I have more than a month before my premium membership expires. May I ask your advise where I should host my blog? It used to be a free blog at WordPress, then I moved to WA and purchased a domain through them. Now I want to stop my premium WA membership, but don’t know if I should go back to WordPress or elsewhere. Please advise. Thank you again. The free blogs at wordpress.com are just for amateur bloggers who don’t have their own domain name. I’m sure you’ll want better hosting than that. I use and recommend DreamHost if you have (or are planning) more than one website. If you only want one website then you may find SiteGround or BlueHost suit your needs. Remember to take into consideration the renewal prices as well as the initial discount when you’re making your choice. And a free SSL certificate is a must. I am not a marketer, it did not work for me. That is why I am leaving WA. I just have a Bible study blog, but I like having my own domain, and all those nice plugins. So I understand that it won’t be free. But WordPress offers various paid plans, so I don’t know how to make a choice. Are SiteGround and BlueHost better? If so, which one of them? Hi, I don’t know if you kind of answered this already to Pauline but I am really a beginner and I didn’t understand. My problem is kind of the same, I cancelled my premium account at wealthy affiliate and I didn’t back up anything. My domain name is still paid (I still own it) but I can´t obviously have access to it through wealthy affiliate and I was wondering if the problem will be solved changing the web servers as you said. But I don’t know what should I change it to (as I said a complete beginner), also the namecheap thing, I already have my website name paid. Do you thing I will need to pay for another premium month in order to move to a web hosting platform? and would wealthy affiliate still have all of the content I wrote saved? Sorry if I haven’t expressed myself correctly and would appreciate any help. It depends on how long it’s been since you left Wealthy Affiliate. 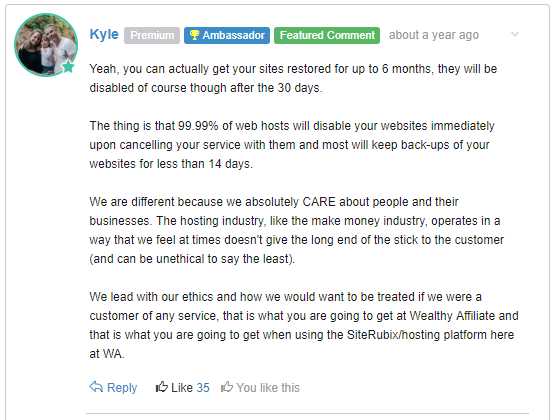 According to Kyle, your website can be restored if it’s been less than 6 months. Please check out this post. Thank you very much 😉 I will write again in case I find any more problems along the way. what is the difference between the files that were backed up from the plugin and the files that were backed up with Filezilla? Do they have the exact same data? Yes, the data is the same except that FileZilla (FTP) does not back up the database. The plugin fails in approximately 10% of cases so I would never rely on it completely. That’s why I recommend using both methods to back up. If the restoration process fails using one method then you have the other to fall back on. I canceled my WA membership without backing anything up (I was ill-informed/not informed prior to). I have transferred my hosting back to namecheap, of course now I cannot log into my WP ADMIN! Any suggestions on what to do here? I’m not too concerned about the 3 articles I had created, it’s that I can’t get into my wp dashboard. When the change of nameservers has had time to propagate throughout the internet you’ll be able to install WordPress on your website through Namecheap. My issue was that I had moved my hosting back to namecheap before backing it up in WA. So, I essentially lost all what I did to my website, and then also I can’t log into my dashboard. The only way to retrieve your content is to go back to Wealthy Affiliate and back it up. This will, of course, involve paying for another month’s subscription. And it’s possible that the content has already been deleted from the servers. In which case you won’t be able to get it back. All you can do is move on from here and start again with a new installation using Namecheap. If I bought my domain name at Wealthy Affiliate do I need to change its nameservers after canceling WA membership and transferring my website to another host or I can use its old nameservers as long as I want? Thanks to this post I managed to backup my website and restore it with the new host, DreamHost. Cannot thank you enough for your assistance and patience. Hi Marion I’ve been following this guide as I want to move to a new hosting platform but came across a different plugin for site migration, just wondering if you know of it and if it works well. it is called All-in-One WP Migration. ooh no wonder it failed when I tried to back up my site. Shame really as it appears to offer the full package.Better strike that one from the plugins then. Popping over to read the post you quoted. I remember that post. One of the commmenters mentioned that although All-in-One-WP Migration limits its FREE migration service to a website no larger than 512 MB (small). it will still work for larger websites, as it migrates only 2 MB packets at a time. He mentioned he migrated 12 large websites from WA to a new host without any difficulty. But how do you reconcile that All in One WP Migration only will move .wpress files? Do we need to convert our files (SQL) to .wpress files? Can the plugin do this for us? All in one WP migration is not free. When it comes to restoring the website you have to upgrade to the premium version. If anyone tells you that they have used this plugin to migrate large websites then they must have been using the premium version. The.wpress files can only be opened and used by the plugin which has created them. So they are totally useless in any other situation. If you’re having difficulties then please avail yourself of my professional services. Marion, you are amazing. I appreciate this comprehensive article. I have been trying to figure it out on my own and found some instructions that just went over my head. But yours are much easier to understand. Thank you for sharing, you have helped me so much!